Professor Rudolf E. Kalman, formerly graduate research professor and director of the Center for Mathematical System Theory at the University of Florida in Gainesville, Florida and the chair for Mathematical System Theory at the Swiss Federal Institute of Technology (ETH) in Zurich, Switzerland passed away peacefully on the morning of July 2, 2016, at his home in Gainesville, Florida. He was 86 years old. Rudolf Kalman was born in Budapest, Hungary, on May 19, 1930. He emigrated to the United States and received his bachelor’s (S.B.) and master’s (S.M.) degrees in Electrical Engineering from the Massachusetts Institute of Technology in 1953 and 1954, respectively, and his doctoral degree (D. Sci.) from Columbia University in 1957. In 1958 through 1964, as a research mathematician at the Research Institute for Advanced Study (R.1.A.S.) in Baltimore, Maryland he produced a series of groundbreaking contributions that shaped the field of Mathematical Systems Theory and of Control Engineering. Chief amongst those was the “Kalman f ilter,” a mathematical framework and an algorithm that enables navigation and control in virtually all modern-day apparatuses, from airplanes to satellites and from cellphones to magnetic resonance imaging. In particular, in its early days, the Kalman filter proved pivotal in the success of the Apollo program that sent the first humans to the moon. Fifty years since his seminal paper entitled “A new approach to linear filtering and prediction problems,” the Kalman filter continues to find new applications in fields as varied as weather forecasting, stock picking, econometrics, GPS, computer vision, autopilots, structural health monitoring, seismology and motor control. Rudolf Kalman’s contributions to the principles of separation between control and estimation, the design of sampled-data systems, optimization, and the structure of dynamical systems per se are timeless. His thought and style of scientific inquiry have educated countless engineers and scientists. His contributions have impacted modern technological and scientific developments across many disciplines. After R.I.A.S., Rudolf Kalman became a professor at Stanford University ( 1964-1971). From 1971 to 1992 he was a graduate research professor and director of the Center for Mathematical System Theory at the University of Florida in Gainesville. Simultaneously , he held the chair for Mathematical System Theory at the ETH in Zurich from 1973 until his retirement in 1997. He received numerous awards, including the IEEE Medal of Honor (1974), the IEEE Centennial Medal (1984), the Kyoto Prize in High Technology from the lnamori Foundation, Japan (1985), the Steele Prize of the American Mathematical Society ( 1987), and the Bellman Prize (1997). He was elected member of the National Academy of Sciences (USA), the National Academy of Engineering (USA), the American Academy of Arts and Sciences (USA), as well as member of numerous foreign Academies. 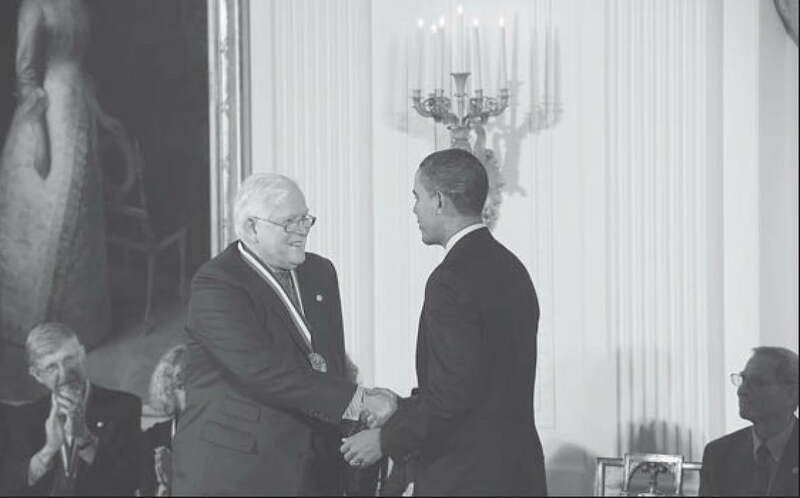 He received many honorary doctorates and, in 2008, Rudolf Kalman received the National Medal of Science, the highest honor the United States gives for scientific achievement. Throughout his career, Professor Kalman led and taught by example. He was a purist in pursuing ideas to completion no matter how long or what effort that necessitated. His publications were gems, with no exception, in both elegance and scientific depth. The “Center” (Center for Mathematical Systems Theory) that he founded at the University of Florida was unique in its scope and reputation. His superb scholarship and magnetic personality was the heart and soul of the Center for over twenty years, attracting the most brilliant colleagues and contributors in Control, Dynamical Systems, as well as many subjects in Mathematics. Professor Kalman is survived by his wife Constantina nee Stavrou, their two children Andrew and Elisabeth, and their families. My deepest sympathy goes to you, my good friends Dina, Elisabeth and Andrew on the passing of your beloved husband and father, Rudy Kalman, on July 2nd, 2016. It was my privilege to know him. He created the Kalman filter.snd became world famous. In 2008, Rudy received the National Medal of Science award from the President of the United States. I so enjoyed the wonderful dinner with you after Elisabeth’s graduation from Stanford University., and the many hours spend together at Stanford. Don joins me in expressing deep sympathy also. Sheralee Hill Iglehart B.S., M.A. I am honored and blessed to have known Rudolph Kalman. His pioneer work inspired generations of young researchers, leading to extraordinary achievements. One day people will look back and realize he opened the door to a new era. Deepest condolences from me and my colleagues. Emanuele Luigi de Angelis, Ph.D.
MY dearest sister Dina and nephew Andrew and niece Elisabeth, you have my deepest sympathy for the loss of your husband and father Rudolf E Kalman. I often wondered if he ever stopped thinking about formulas and equations as he sat thinking and twisting a strand of his hair! He was an amazing person and I was proud to be related to him through you. Costa and I send you our love. I was honored and very privileged to have been invited by Professor R E Kalman to give a lecture at Stanford University in 1970. At that time he was interested in what happens to his pioneering theory on the Linear Quadratic Regulator when the matrix of the control cost is singular. Professor Kalman is the pre-eminent control theorist of our time. Unfortunately I only know Rudolf Kalman from his work but have never met him. I truly admire his work, what we use in an every day bases. We are organizing a summer school and a workshop on uncertainty quantification and parameter update in Budapest. I wondered if the family members would not mind if we would call the stipend for free admission that we give for talented students as Rudolf Kalman stipend? It would be a privilege for us to show appreciation of his work like that. Professor Emeritus Kalman, a long-time mentor at UF, was awarded the National Medal of Science for his development of the Kalman filter.